A start for post processing effects in Cesium. I trimmed down this PR so it only applies to scene post-processing. Per-entity post processing will be ready soon too, but I want to keep this PR a bit simpler. @byumjin u_depthTexture now works so you can test out SSAO. However it uses the last frustum's depth only! This actually works okay for some situations, but to guarantee that only one frustum is rendered, set scene.farToNearRatio to a large number like 100000000.0. I'll bump again when this is ready to review. // and instead shadowing is built-in. In this case execute the command regularly below. All these changes are just reorganization without code edits. The debug show bounding volume code is just moved to its own function. Bump - in case this is important. This is fine for now. This would need to change for multiple viewports, but a lot more work would need to be done to get post-processing per-viewport. A PostProcess takes an input texture and output texture and applies a list of PostProcessStage sequentially. It uses a context-wide texture cache for ping-ponging. But it does not support down-scaled textures. PostProcessStage contains a fragment shader and custom uniforms. More complicated effects like AO may require custom stages which "inherit" from PostProcessStage. PostProcessAmbientOcclusionStage for example contains an internal PostProcess that is used to generate the grayscale AO texture. The fragment shader of the stage blends the AO texture with the color texture. PostProcessCompositeStage is "inherited" from PostProcessStage and is a way to define a stage that contains multiple stages. I don't know if this code is actually used, but its convenient for effects like a blur stage, which would be composed of blurX and blurY stages. PostProcessLibrary is a global store of post processing stages. PostProcessScene contains a PostProcess with common stages grabbed from PostProcessLibrary (all disabled by default). @bagnell @pjcozzi the todo list is up-to-date. Move AO generate shader to its own GLSL file. Move AO shaders to GLSL files. Generate random texture at run time. More clean up from review. @lilleyse updated. This should be ready. Looks ready to me. I think this is safe to merge for 1.45 but can push if anyone prefers it wait. If we're confident this is pretty well isolated - taking into account OIT, sun bloom, etc.- and well tested, OK with me to merge for 1.45. Otherwise, let's not take the risk with everything else already going in, e.g., log depth, ion, etc. I'm against this going into 1.45, there's no way it's tested enough. I think the dev guide needs to cover renderer refactors and features like this to ensure consistent and sufficient testing. For example: Did we test this on all browsers, including ones our team rarely uses like Safari? What about iOS/Android? Did we run through every Sandcastle like we do in release testing? Changes like this PR need to have way more scrutiny. Example A: IE11 is completely broken in this branch. 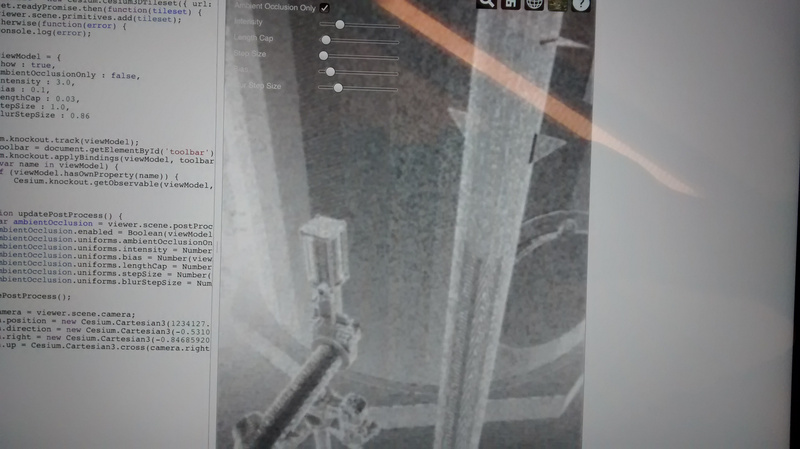 Cesium Viewer renders a black canvas. Fix blank screen and FXAA in IE. Fix crash when the Sun is visible after last commit. @lilleyse This is ready. I fixed the issues in IE and Edge. Depth textures aren't supported in IE so any stage added to the collection that requires a depth texture will not be run. If one stage in a composite won't run, then neither does any stage in the composite (also goes for composites of composites). Can you review this and #6476 soon? I'd like to merge then as soon as possible so they have a while to sit in master before the next release. Add a test that checks that post processing works as expected when depth textures are not supported. Should requiresDepthTexture be replaced with a generic isSupported function? Since it's part of the public API it should probably take scene instead. Annoyingly, there will probably need to be a duplicate function that takes context, for internal use. There are a few areas in the post processing code that check if ao is enabled by checking if depth textures are supported. Those areas should call this function instead. Modify random value texture sampling. The new changes look good. I tested in as many browsers as I could (Chrome, Firefox, Edge, IE, Safari) and Safari on an iPad. Internet Explorer ignores unsupported post processing stages correctly. As a final safeguard, it might be good to check isSupported and log a message in the AO/DOF/Edge detection Sandcastle demos so that people using IE or devices without depth textures understand why the post process isn't showing up. The only artifact that I noticed is AO graininess on the iPad. It used to be worse before 5e11e9e but it's still worth showing what's happening. Whether or not this is something we can fix, I don't know. Error: Timeout - Async callback was not invoked within timeout specified by jasmine.DEFAULT_TIMEOUT_INTERVAL. Travis failed due to an unrelated failure in makeZipFile. Just in case, I restarted the build and will merge when it passes. I'll look at #6476 soon as well. Ok it passed. Thanks @bagnell!